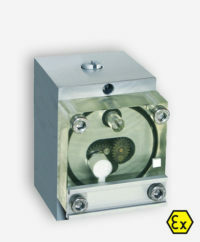 The Kytola Model SRx flow meter is an oval gear, positive displacement meter, designed for accurately measuring the flow of lubrication oil, regardless of its temperature or viscosity. The transparent cover makes it easy to identify consistent flow, and the unit features bypass valves for “on the run” service. Alternative products in a similar style include the Model SR and Model SRx-x.